Let's see--we have boating, fishing, swimming, golfing--and what else? There's such a variety of things to keep you entertained while you're in West Michigan! Tour Historic White Pine Village, enjoy a thrilling dune ride,take the family out for a game of mini-golf, bowling, or catch a concert. You can't leave the area without visiting one of the spectacular lighthouses of the region, and just catching the sunset over Lake Michigan is worth the trip. View the S.S. Badger carferry as it sails into or out of Ludington, or hop on board yourself for the four-hour trip across the big lake. Boredom is never a problem here in West Michigan! Circle Rocking "S" Children's Farm, Inc.
Providing Animal Touch Therapy and Recreation for persons with disabilities. Circle Rocking "S" Children's Farm is dedicated to providing animal touch therapy and recreation free of charge to persons with disabilities. 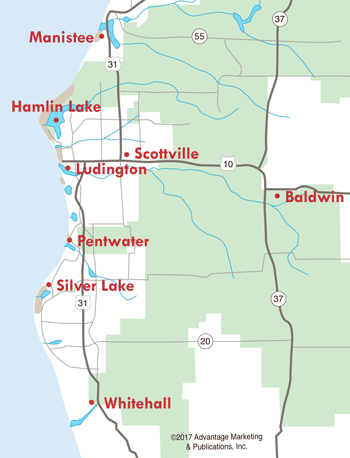 The Ludington Youth Sailing School is a non-profit organization that promotes the safety and enjoyment of sailing, with on the water classrooms. Students, ages 8-17, will learn the fundamentals of sailing, basic terminology, and life-long sailing skills. US Sailing Association certified instructors provide a safe and comfortable atmosphere to learn. Visit Sandcastles for fun and learning! Featuring 3 floors of interactive exhibits designed to promote hands-on discovery, creativity, curiosity, awareness, and love of learning. Attractions include a real Cessna Airplane, Badger replica, bouldering wall, the Ludrock Soundstage and more. Special programs are also scheduled throughout the year. See link for current hours. Probably the most well known park in Ludington, located at the beach at the end of Ludington Avenue. In addition to its great location and view of the North Breakwater Lighthouse, Stearns has a large, shaded picnic area on grass, grills, play equipment, restrooms, and of course, great swimming. In an iconic location just three blocks from the beach, Old Baldy Food & Fun is an oasis of ice cream, BBQ, and family entertainment. Enjoy mini-golf and a video game arcade featuring retro favorites, with a taste of Virtual Reality coming in July. Like us on Facebook. Looking for more Summer Activities?